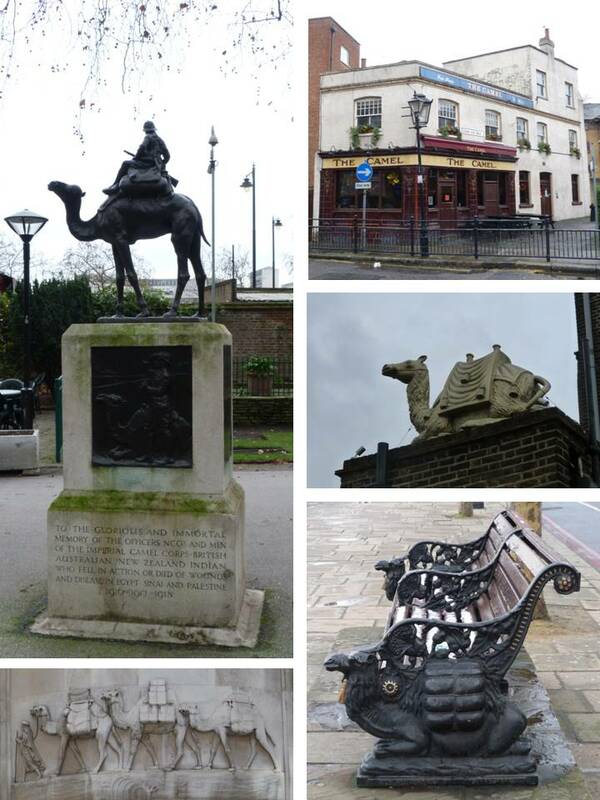 Clockwise from top left: Camel Corps memorial, Victoria Embankment Gardens; Camel public house, Sugar Loaf Walk, Globe Town; ‘Camel and Artichoke’ – whaaat? – public house, Lower Marsh, Waterloo; seat with camel motif, Embankment (near Cleopatra’s Needle); “amusing relief of camels and a driver” (Pevsner), Peek House, Eastcheap (once a tea and coffee warehouse, hence the “singular Graeco-Egyptian details”). This entry was posted in History, London, London History, Quirky stuff and tagged Camel, Eastcheap, Lower Marsh, Pevsner, Victoria Embankment Gardens on December 1, 2013 by Bob Jones - The Lost City of London.